Lulu & Po's burger is a simple take on the American classic with goat cheese and caramelized onions. FORT GREENE — Lulu & Po has the best thing going between two buns. More than 40,000 votes were cast in the final round of DNAinfo New York's Brooklyn Brackets for best burger — and about 25,000 were for the tiny Fort Greene restaurant's two-patty burger. Over the month-long competition Lulu & Po beat out Brooklyn burger giants like Williamsburg's Peter Luger, Red Hook's Hope & Anchor and Carroll Gardens' Prime Meats for the title. 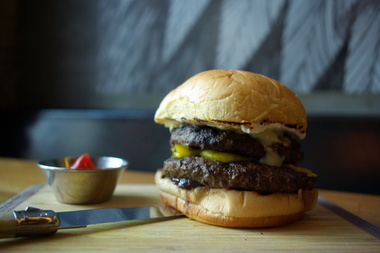 Chef and owner Matthew Hamilton called his burger a "simple, upgraded take on the American classic burger." He uses a DeBragga beef blend to make two slim patties simply seasoned with salt and pepper and adds soft goat cheese, house-made zucchini pickles and caramelized onions served inside a sesame-seeded Martin's Potato Roll (like the ones he grew up with). The result is a melty mess of a sandwich with a burst of acid from the zucchini, creaminess from the cheese and sweetness from the onions with a juicy finish from the meat. "I think it should all melt together," said Hamilton, who opened Lulu & Po three years ago. "I grew up with burgers that smooshed together into a big, beautiful, juicy sandwich — that's what it's supposed to be." Hamilton was overjoyed at his win and said in the short time he has been in the neighborhood locals have grown to love the spot — and many come regularly. The burger, like the restaurant, is meant to be unpretentious yet slightly different from the norm. Hamilton wants patrons to feel at home and comfortable. "People should walk through the door and feel like they are at a dinner party in someone's house," he said. Lulu & Po is small, intimate and decorated with locally salvaged wood, industrial-style chairs and exposed brick. Hamilton, who lives in Clinton Hill with his wife and daughter (Po and Lulu), decided to open his own restaurant only after he saw the space. "It was the perfect spot for what I wanted to create — a family-style restaurant," he said. "Plus I can walk to work, take my daughter to school and be a part of the neighborhood — I love that." Lulu & Po is located at 154 Carlton Ave. on the corner of Myrtle Avenue in Fort Greene. Sunday nights guests can enjoy a burger and beer for $15.